Marathons and other running sports are heating up with the warming weather. If you are a running enthusiast, conditioning exercises are essential so the body can sustain the demands of the sport. Yoga fitness is one great conditioning workout which is perfect for runners or sprinters. To enhance your speed and flexibility, the stretching exercises and poses you will learn in yoga fitness sessions in Foxboro, MA can promote muscle lengthening of the extremities. It will also condition muscles groups that are less activated when sprinting. Running in long stretches can make you prone to injuries. But with yoga training, you can strengthen your muscles especially those muscles involved in running such as core, hip flexor, hamstring and quads. Performing yoga stretching and meditation can relieve muscle stress. It prepares your body for the long run so you will experience less body pain after the race. If you think yoga fitness workout can improve your running performance, you are absolutely correct with that. Contact Answer is Fitness to find out more about yoga fitness. Almost all of us have a history of multiple weight loss program attempts. Some people will try almost anything that promises them to lose weight very quickly. Unhealthy shortcuts such as fad diets are often attempted but seldomly succeed in delivering long-term positive fitness results. Indeed, fad diets don’t result in long-term weight loss and sometimes can be detrimental to your health. If you’re looking for a fast and healthy way to lose weight, consider insanity workout and see dramatic results in just 60 days. Our “Insanity” workout in Foxboro, MA is one of the most challenging fitness programs available and will produce fast and measurable results. This high-intensity total body workout is based on “max interval training” in which you’ll exercise hard at a very intense pace for a short period of time, with 30-seconds of periods of rest in between. Insanity workouts do not require gym equipment. The workout uses your own body weight for resistance. You’ll be able to reap the rewards of some serious cardio as well as burning a number of calories and sculpting every muscle groups of the body. It’s time to prep your body in shape and get it summer-ready! Begin your insanity fitness training today and give it your all when you’re ready to take the plunge. Our certified personal trainers will help and guide you every step of the way. Contact Answer is Fitness to get you started. Starting a fitness regimen can be intimidating and sometimes frustrating when you over-complicate things. If you are just now starting your fitness program, consider starting with less intense exercises and work up from there. Zumba Fitness is one great example of a low-impact workout that can be individually dialed-up or down at the individual participant level. Zumba Fitness Workout is perfect for all ages because it is less vigorous on top of the fun and engaging atmosphere of the class. It's a dance workout that synchronizes steps and moves to the upbeat Latin music. Since the workout is presented more like of a dance party than a workout session, you won't notice the time you spend dancing in the studio floor. You will even be more hooked when you finally nail all the cool moves and steps of the dance routine. The key to weight loss is consistency. If you join Zumba Workout Session in Foxboro, MA, you will definitely gain its other wonderful health benefits. Aside from effectively burning fats and calories, it can also improve your balance and coordination. As the dynamic music can beat down doldrums and blues. Contact Answer is Fitness to find out more about Zumba Fitness. Golf season is fast approaching. As you begin practicing your swing for the upcoming golf season, it's very helpful to explore other training or exercise that will enhance your skill and endurance. Golf requires coordination of core and upper extremity muscles. Consider Pilates Exercise which is an ideal workout if you seek to improve your golf swing. To nail that swing, multiple muscles and joints must synchronized actively. When muscles and joints are not properly conditioned, they can easily strain during repetitive swing. Strains and injuries are common issues when muscles and joints don't coordinate well or was not adequately conditioned. Pilates For Golf aims to address this matter. The stance and movements that you will learn in this class will greatly benefit the muscles involve in playing golf. Through Pilates Workout in Foxboro, MA, will improve your golf performance by enhancing your muscle movement and timing. If your sport greatly demands correct posture and excellent muscle flexibility, then strongly consider Pilates exercises. Contact Answer is Fitness to find out more. Most understand the benefits of working out but not all look forward to doing it. If getting active and physically fit were easy, we might never need the help of others. If the single demand on our time was physical fitness, that would simplify things. But the reality is that stress from kids, jobs, senior family member care, and managing a household all combine to challenge your time prioritization away from fitness. Your fitness endeavors must be genuinely mentally and physically exhilarating to warrant your time prioritization. For many, there’s no better exercise that delivers the physical and mental rewards of Zumba fitness. Zumba’s dance exercise is so rewarding that it alone can return you to a true state of self-motivation as it pertains to your physical fitness training. 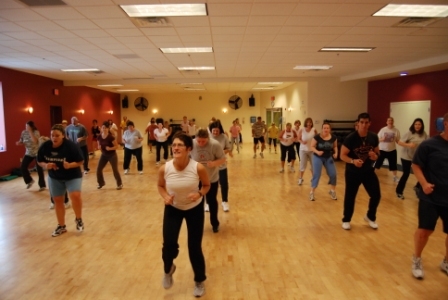 Our Zumba fitness classes in Foxboro, MA offer a full-body workout that engages every muscle group of the body. It combines fast and slow dance moves with elements of resistance training. This exciting workout encourages social interaction before, during, and after the workout. The social aspect of Zumba is different from most workout situations because the more fun you have the more likely you want to keep doing it. As you improve your dance moves, you feel increasingly more comfortable with your progress and thus boost your confidence and desire for more. People of all ages, abilities, and levels can participate and improve their overall health through Zumba fitness. To learn more about the benefits of Zumba fitness, contact Answer is Fitness.